It’s probably safe to say that there has been a point in everyone’s life where they felt invisible, like the people around them on the street, in the club, or in the classroom literally didn’t know they existed. What if that were actually the case? Wouldn’t that be maddening? What if they were intentionally pretending not to notice? Wouldn’t that be a conspiracy? What if it that cold shoulder was a matter of life and death? Wouldn’t that be Another? 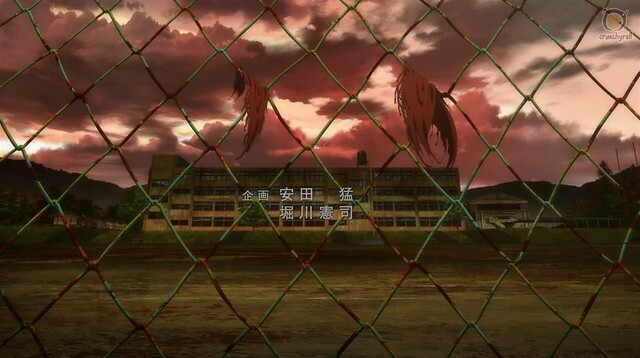 Based on a novel by Yukito Ayatsuji, Another focuses on Yomiyama North Junior High ninth grade’s class 3. Kōichi Sakakibara, the male lead, transfers in from Tokyo, but even before he can step inside the school, he suffers a collapsed lung that puts him in the local hospital. A seemingly well-meaning bunch of representatives from class 3 visit Kōichi, but there’s something in the air that makes the gathering feel more like an investigation than a welcoming committee. For the first half of this 12-episode series, Kōichi tries to ascertain the reason behind his classmates’ enigmatic avoidance of certain subjects and specific people. 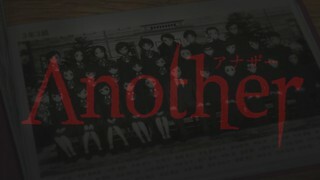 The remaining episodes feature Kōichi trying to figure out a way to stop the rash of mysterious deaths plaguing class 3 without becoming one of the victims himself. From its onset, Another frames its female lead, Mei Misaki, a student with an eye patch who lives above a creepy doll museum/shop, as an ambiguous entity. She appears and disappears at will and without warning, and no-one seems to see her ... except Kōichi. 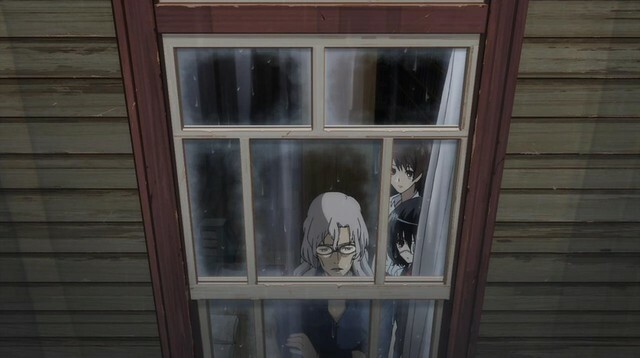 Mei could be a ghost or the walking spirit of a hollow doll or just another ninth grade student. The series is written and directed frustratingly well in that regard, so well that I almost threw something at my computer screen when the series decided to show its cards in episode five. Thereafter, the lack of ambiguity is certainly disappointing, but luckily the series has a lot more to offer to maintain viewership. Let’s start with the bloodlust. As gruesome as the death scenes are, Another’s real power lies in its imagery. As I mentioned earlier, there are a string of deaths at Yomi North. None of the initial incidents are malicious. Instead, each is set off in a manner reminiscent of Final Destination. Some deaths are masterfully foreshadowed, and some serve as ambient sucker-punches. Regardless, the series spares no effort and pulls no punches in delivering a mix of off- and on-screen misfortune in beautifully choreographed, horrific detail, making the tragedies, for the most part, 100% believable. But gore can get tiresome when put into heavy rotation, especially when the causes are random accidents. There needs to be motive, and here’s where Another’s linear plot turns from disappointing to exhilarating. Something is found. Information is revealed to a select few. But once the information is leaked, Another’s epic climax, comprising acts both emotionally twisted and disturbingly violent, carries interest through to the bitter end. As gruesome as the death scenes are, Another’s real power lies in its imagery ... and I’m not just talking about the superfluously interjected shots of creepy dolls. The art is all about isolation and diminishing the presence of the individual to make it feel stranded and helpless. The portrayal of empty moments via scenery would make a Romantic weep. 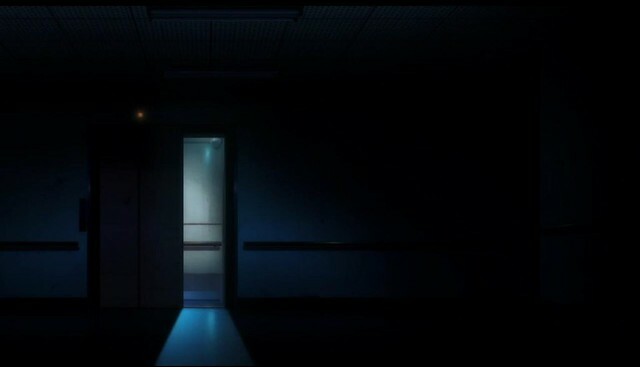 For instance: a door methodically sliding opening to expose the hollow guts of an elevator that's just arrived to the vacant hallways of the basement floor, on which the only room that has bodies in it is the morgue. The art is all about isolation and diminishing the presence of the individual, or in some cases humanity itself, to make it feel stranded and helpless. To his effect, the scenery is rendered such that it usually dwarfs the characters. Lush landscapes and detailed backgrounds (oh my god the textures!) are deliberate in setting this mood. Water-stained walls, paint-stripped wood with scrapes and obvious wear, and rusted metal surfaces create a realistic world that’s lost the attention of its inhabitants and fallen into decay. And while the persistence of setting may be overwhelming, it is none-the-less striking when considering its relation to the story. In fact, backgrounds are so wonderfully rendered that the characters feel superimposed by comparison. Often I found myself sighing whenever characters would return as the main visual focus (often when involved in close discussion). 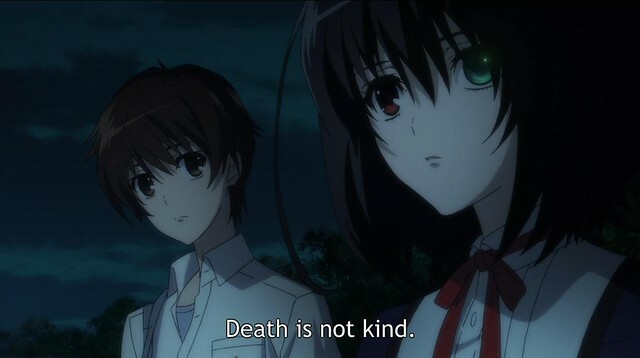 The character designs feel a little too clean or bright compared to their surroundings, almost as if they have not interacted with the darkness at all or are completely repelled by it. Each student is very distinguishable, which is a feat considering how many average-looking students are in class 3, although most are 2-D and forgettable (which is forgivable given their cannon fodder nature). One of the more distinguishable secondary characters, Izumi Akazawa, seems to be drawn to ooze tsundere, but her role is written such that her appearance is surprisingly the only 2-D thing about her character. Mei’s character, however, is a rather big disappointment. Her personality can seem painted on at random, changing from pensive or sullen to mischievous to almost flirtatious without actually fitting the scene. Of course this jarring effect does make the character seem a little more out of sync with her classmates, which sometimes lends to the overall ambient effect of the series. Short and maliciously sweet at 12 episodes, Another is worth the time investment. Pacing helps. Despite lingering shots of scenery, appetites are either satiated or left wanting more at each episode’s end. On the whole, this is a very satisfying bit of horror that, even when its mystery element is 99% exposed early on, has a lot to offer viewers by way of visual storytelling, Romantic images, luscious art, gratifying gore, and the always fun decent into madness. Another is not without its faults, but they are rendered almost forgivable due to its popcorn-horror nature. This review is based on a premium Crunchyroll stream on the reviewer&apos;s personal account.